Photo courtesy of Gene Lowinger Click for full version. As a Blue Grass Boy: Gene Lowinger was the first Northerner to fiddle for Bill Monroe, and only the third on any instrument, after Bill Keith and Peter Rowan. He first played with Monroe in 1964, filling in on shows in the northeast. 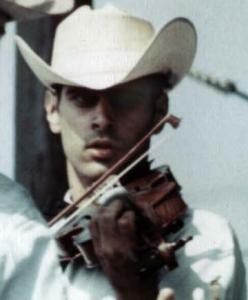 He later was hired as a regular Blue Grass Boy and stayed for about eight months. Before and After: After leaving the Blue Grass Boys, Lowinger studied classical violin and viola for several years, and later became a professional. A serious neck injury forced him to leave music for many years, but he has recently returned to bluegrass. In 2000, he led a band called Avalanche; he curently fronts the Gene Lowinger Band. He has also written three books on fiddling, as well as a memoir, I Hear a Voice Calling, and is a professional photographer.